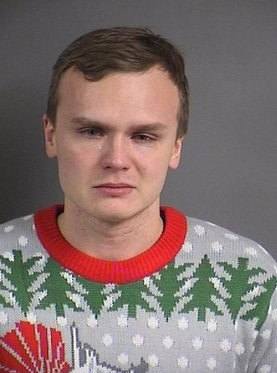 The 26-year-old Iowan’s holiday spirit appears to have sagged early Sunday after he was arrested for drunk driving. Following a minor accident, Edwards was found by cops at the wheel of his 2016 Chevrolet Malibu. Edwards, an Iowa City resident, smelled of booze, had bloodshot eyes, and impaired speech, according to a police report. A subsequent Breathalyzer test recorded his blood alcohol content at nearly three times the legal limit. As seen above, the teary Edwards was wearing a festive Christmas sweater when he posed for his mug shot. Court records do not identify Edwards’s holiday drink of choice.